James D. Young, MD is proficient in all aspects of adult urology. He has special interests in the diagnosis, treatment and prevention of kidney stone disease and management of BPH. He also specializes in seed placement for prostate cancer and no-scalpel vasectomy. Dr. Young is a native of Tidewater. He practiced urology with Urological Associates in Charlottesville, VA for four years and relocated to Virginia Beach to be closer to family. 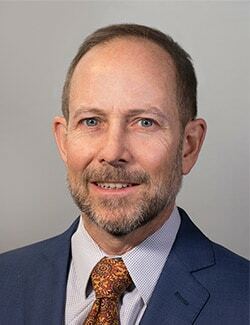 He joined Urology Associates of Tidewater, which subsequently merged with several other urology practices in the Hampton Roads area to form the current Urology of Virginia. Dr. Young helped the group transition to electronic medical records, and he is especially excited about the current computerized medical records system and the synergy generated by the combining of staff and medical talents under one roof. Dr. Young is married with two children. Together they enjoy tennis, travel, camping and skiing. Dr. Young donates much of his free time to the Boy Scouts of America. Dr. Young is a member of the American Urological Association, the Mid-Atlantic AUA, the American Medical Association, the Virginia Medical Society and the Tidewater Urologic Association where he is serving as the Secretary and Treasurer. Dr. Young is board certified by the American Board of Urology and is a diplomate of the National Board of Medical Examiners.